A New Jersey energy service provider’s computer room was prone to leakage. They had recently acquired new 2 UPS units and 2 new CRAC (Computer Room Air conditioning) units. The company purchased and installed the AquaTray system to provide partial coverage of their computer room, an approximate 170 square footage of protection. A standard ceiling grid was used successfully. Areas with sprinkler heads were protected using sprinkler boots. For areas that were “landlocked” (areas between a wall and a drainage panel) raised flat panels were utilized. 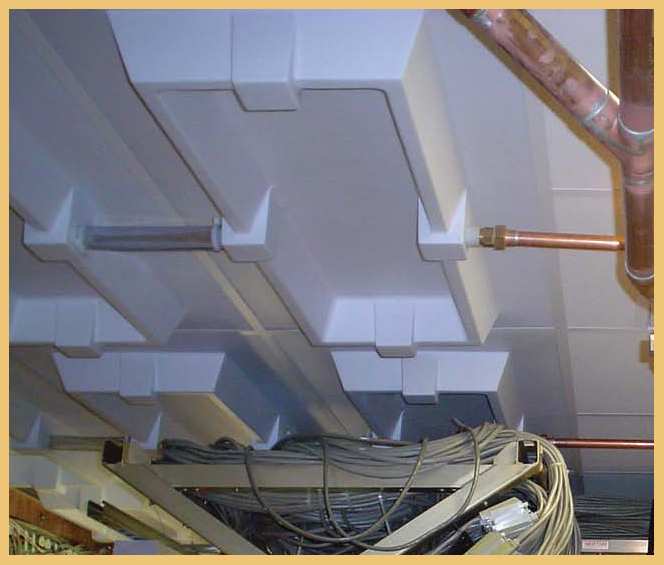 These panels provide coverage with less drainage fittings. ERCO, the installing contractor, submitted the project to their local chapter of Associated Builders and Contractors, Inc. and won the Innovation Award in 2014. A major Healthcare Company purchased and installed the AquaTray® System to roughly cover 1000 square feet of a 1,600 foot Telecom Room. 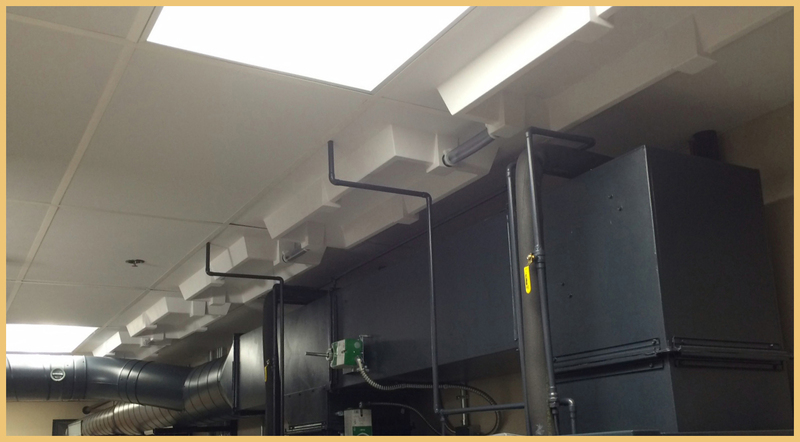 This installation included drainage trays and flat panels supported by a typical ceiling T-Grid. Copper piping was used to carry away potential leakage to its final drain destination. 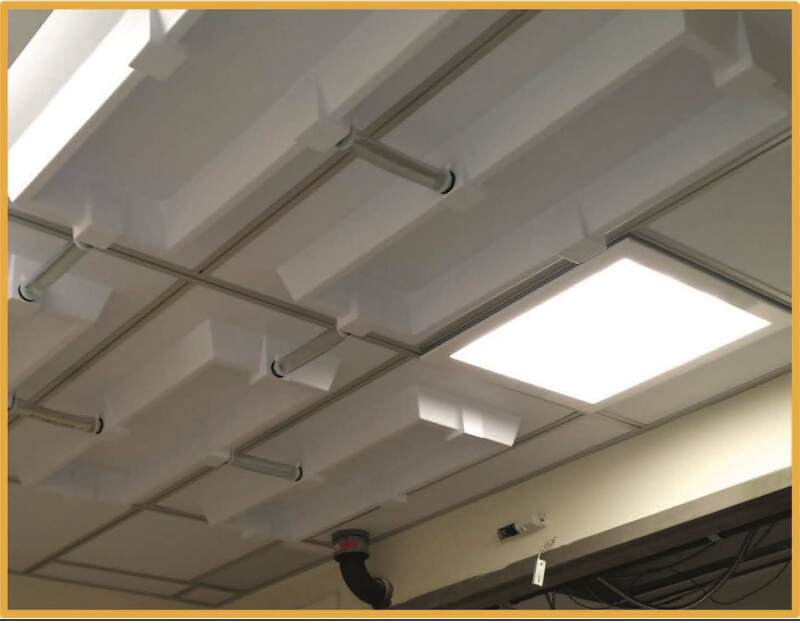 A GSA Government Client purchased and installed the AquaTray® – Leak Barrier Ceilings system to protect its Uninterrupted Power Supply (UPS) room at its Philadelphia site. The project covered approximately 228 square feet using a combination of drainage panels and raised flat panels. This installation utilized an emergency drain shown at the bottom-center of the photo, designed to funnel potential water leakage to a water drain in an adjacent room. The AquaTray® system was completely installed in a heavy duty Gordon DC1.5 grid.